A Reinhardt alumnus will be sworn in as the top law enforcement officer for Cherokee County next year. 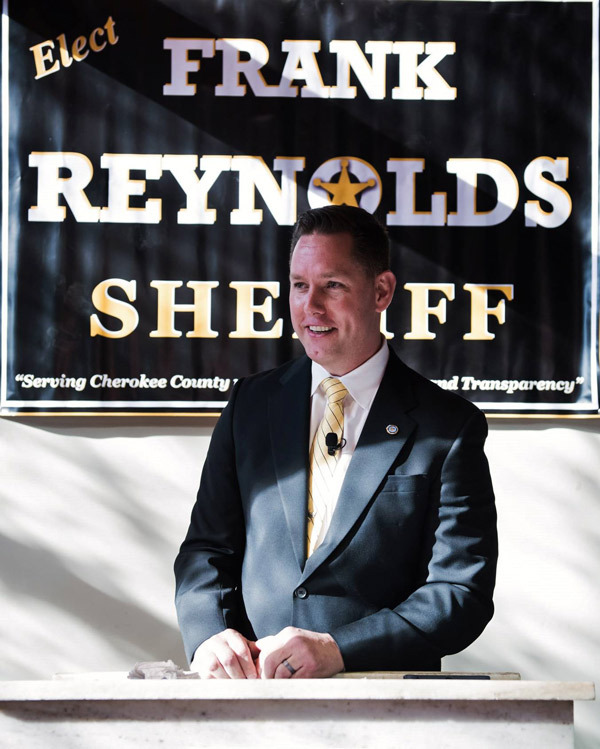 Frank Reynolds secured the spot with almost 70 percent of the vote against three other candidates for Cherokee County Sheriff in the May 24 Republican Primary. Frank Reynolds ’10 secured the win for the Cherokee County Sheriff’s race during the May 24 Republican Primary. He earned almost 70 percent of the vote. Reynolds is a captain for the Pickens County Sheriff’s Office and earned several endorsements during the campaign including four Cherokee County municipal mayors whose cities have police departments and current Sheriff Roger Garrison, who has led the Cherokee Sheriff’s Office for 24 years. Reynolds, 45, earned his associate’s and bachelor’s degrees from Reinhardt University. He said his early days of post-secondary education were not ideal, and Reinhardt faculty, like Dean Ron Bass and art professor Curtis Chapman, encouraged him to strive to do better. Another encouragement came from Garrison, who put a strong emphasis on higher education within the sheriff’s office. “I started in 1989 and had no earthly idea what I wanted to do. I wasn’t a good student at all. My focus was not on school. It was on other things. I left Reinhardt for a little bit and realized all I had was a high school education but was only few hours short of an associate degree,” Reynolds said. 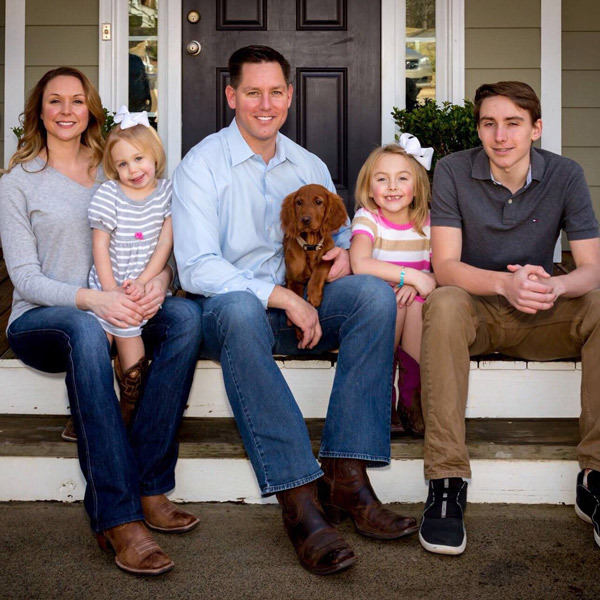 Cherokee County Sheriff-elect Frank Reynolds ’10 lives in the Clayton Community with his wife, Dr. Jennifer DeBord ’04 Reynolds, daughters Sophia (left) and Amelia (right) and son Frank, Jr. It was in 1994, that he started with the Cherokee Sheriff’s Office, which was about the same time Garrison was graduating with his bachelor’s degree. In 1995, Reynolds earned his associate degree in fine arts from Reinhardt. Seeing that Cherokee’s top cop was setting the example for his deputies, Reynolds felt encouraged to go back to school. So back to Reinhardt he went, a little at a time. The proximity of the campus to his home was beneficial, as Reynolds and his family live around the corner in the Clayton Community. It was at Reinhardt where Reynolds met his now wife, Dr. Jennifer DeBord Reynolds. She was pursuing a bachelor’s degree in fine arts as well. Dr. Reynolds ’04 now holds a doctorate degree in special education from Liberty University and works for the Cherokee County School District. The Reynolds family now includes three children: Frank, Jr., Amelia and Sophia. The Reynolds’ family has even more connections to Reinhardt, as Reynolds’ older brother, Roy, is the head coach for the women’s lacrosse team. As Reynolds juggled life and work, he chipped away at his classes and was the last Reinhardt College class to graduate in 2010. The next class would be Reinhardt University graduates. Aspects of Reinhardt Reynolds said he enjoyed were not only the family atmosphere and the feeling of comfort but also the school’s ability to work with a student so they can finish their education. While his degrees were not concentrated in law enforcement, which he chose to pursue after participating in a ridealong in Athens, Reynolds said there are plenty of aspects of the schooling that translate to his current work. One thing in particular is that it taught him how to think differently. Analytical by nature, classes in abstract art, for instance, taught him to look at things differently. After graduating from Reinhardt, Reynolds went on to earn his Master of Public Administration with a concentration in Judicial Administration. It was part of his 20-years-in-the-making preparation to one day become the sheriff of Cherokee County. As Reynolds prepares to take the reins of the department that serves more than 230,000 Cherokee County residents, he said partnerships are important, including one with Reinhardt. “I would like to talk to Dr. (Kina) Mallard and see how we can help them and how they can help us,” he said. Reynolds said he feels Garrison has a strong relationship with Reinhardt, and he hopes to continue that legacy.